It gives me real delight to visit your beautiful city. Bath deserves its reputation as one of the most lovely and elegant cities in the UK. As a result, none should be surprised that Bath was listed as a world heritage site in 1987. 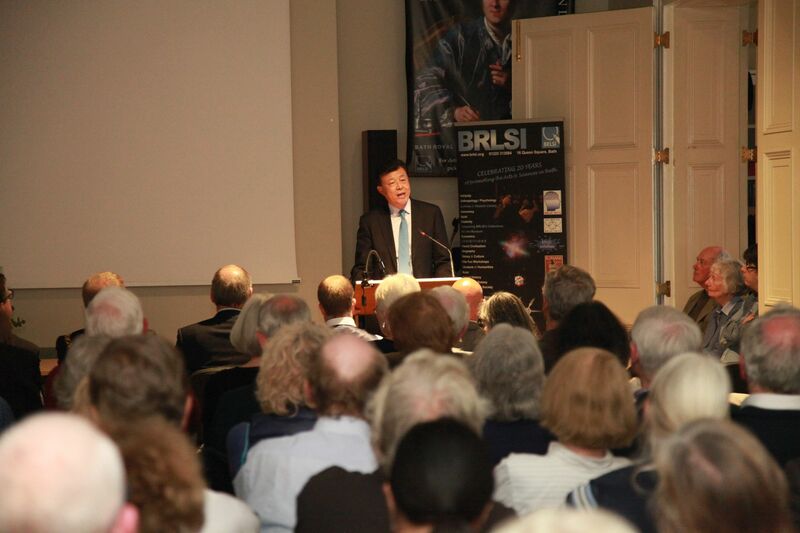 I am honoured to be invited to speak here at the prestigious Bath Royal Literary and Scientific Institution. Over the years, your Institution, the University of Bath, the Bath Spa University, and many other well-known institutions here, have made enormous achievements in education and research. You have cultivated a large number of top-class specialists in different areas. Also, from a Chinese perspective, Bath has made a remarkable contribution to the educational exchanges between China and the UK. The University of Bath was one the first in Britain to enroll students from the People’s Republic of China. Many of the young Chinese students who studied here in the 1970s are now leaders in their respective areas back in China. They have made tremendous contribution to China’s development. An excellent example is China’s top diplomat State Councillor Yang Jiechi. · You are the future of China. · You also represent the future of the China-UK relationship. · I hope you like it here and do well in your studies. · Your achievements here can make your country proud of you. · And, in turn, you can utilise the the knowledge and experience gained to promote positive China-UK relations. Today’s event is one of the Institution’s World Affairs Lecture series. The theme of these lectures, World Affairs: Through Our Eyes, is a reflection of the global vision of the Institution. 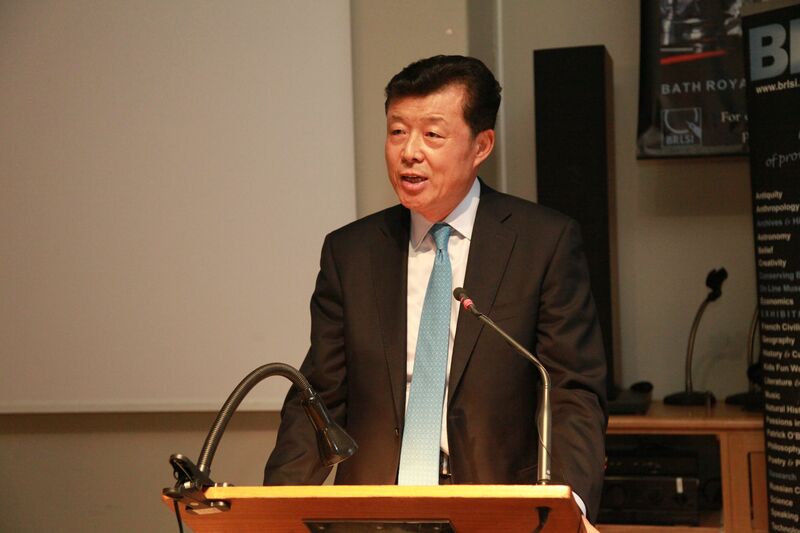 I thank you for focusing on China in this very first lecture of the series. This certainly underscores the importance that you attach to China-UK relations. · First, how should we look at China’s development? · Second, what does China’s development mean to the world? Let me start with answers to the first question. The most frequently asked question nowadays is whether China’s economy will have a “hard landing”. I have just returned from my annual leave and official consultations in China. I would like to share with you an authoritative analysis of China’s overall economic performance. I can tell you with complete confidence that the fundamentals of China’s economy remain strong and positive in the long run. There are bright prospects overlooked by those foreign observers who predict a “hard landing”. Here are four reasons for my optimism. First, economic figures show that China has maintained a reasonable growth rate. Amid worldwide slowdown in 2015, China continued to grow at 6.9%. Though this was for the first time below 7%, that growth, nonetheless, represents an added amount that is equivalent to 10% growth five years ago, given the fact that overall GDP now stands at ten trillion US dollars. The increment is almost the size of the annual GDP of a medium-sized country. Compared with other major economies, China is definitely in the lead in growth rate and at the top in absolute increment. In the first quarter of this year, China’s GDP grew at 6.7%. This suggests a steady start to 2016. Most economists around the world believe that China’s economy is turning for the better. In its World Economic Outlook published in April, the IMF raised its forecast for China’s growth in both 2016 and 2017 by 0.2%. This is a clear sign of confidence in the long-term, steady growth of China’s economy. My second reason for optimism is that China’s economic structure is undergoing major and positive changes. The current moderate growth, to a large extend, is the result of China’s proactive structural adjustments. So, to have an accurate understanding of China’s economic performance, one needs to look at not only the speed of growth but, also, how growth spreads out sector-wise. In terms of industrial structure, the service sector, for the first time in history, made up more than half of China’s total GDP in 2015. This was 2.4 percentage points higher than that of 2014. The advance of the service sector is highly significant as it is a core driver of China rising up the value added economic chain. In addition, the service sector growth is a path that creates a high level of well paid jobs. In terms of demand, last year consumption contributed over 60% of China’s total growth. Domestic demand became the major driver of growth. In terms of the quality of growth, energy intensity per unit of GDP continued to decrease and livelihood-related indicators remained stable. A total of 10.66 million new urban jobs were created in 2015. This momentum continued in the first quarter of 2016. Most significantly, the service sector expanded by 7.6% and continued to have a higher share in the GDP at 56.9%. This was two percentage points higher than the same period last year. Both individual income and consumption have increased faster than GDP. These positive trends are all evidence of steady progress of structural adjustments. Recent studies suggest that the conventional way of economic analysis, with too much focus on industrial statistics, usually fails to reflect the true picture of China’s economy in transition. This view deserves some attention. My third positive point is that China’s economy has huge potential and much space for further growth. China is undergoing a new type of industrialization, IT application, urbanisation and agricultural modernisation. In this process, China’s economy will build up its resilience, display its potential and open up space for growth. China’s urbanisation rate in 2015 was 56.1%. That is quite low compared with the advanced economies, where urbanisation is usually above 80%. What this means is urbanisation in China will provide ample space and demand for growth. Another growth potential lies in the regional development gap. China’s western provinces are at least ten years behind their eastern peers in terms of development. The demand for better infrastructure and higher quality of life in China’s western provinces will release tremendous development potential. Then we should look at the advantages in Chinese education. China has the advantage of well-educated work force. In China, over 110 million people have an associate degree or above. This is a huge pool of talent which will sustain further development in China. While moderately expanding overall demand, the government is also focusing on supply side reform. The reform, which improves supply-demand relations and market expectations, has produced initial effects. A few words about the debt issue in China which recently caught media attention. China’s deficit and government debt is secure and much lower than that of the US, Europe and Japan. This leaves enough room for further macro-regulation. My fourth point regarding optimism is that China has mapped out a new blueprint for development in next five years. This is known as the 13th Five Year Plan. 2016 is the opening year of the 13th Five Year Plan. It also marks the beginning of a crucial stage leading up to the building of what Chinese people call, “a moderately prosperous society”. The Plan rolls out major goals, tasks and measures for the economic and social development in the next five years. It marks the beginning of a new journey towards economic transition and upgrading. The highlights of the Plan are five development concepts. They are innovation, balanced growth, green economy, opening-up and inclusive development. · Innovation will become a new growth driver and will need an economic system and structure that is more innovation-friendly. · Balanced growth will strengthen the weak links and open up more spaces for growth. · Green economy prioritises environmental protection and the pursuit of a low carbon economy. This means more emphasis on energy conservation and emission reduction. · Opening-up means China will continue to improve its opening-up layout and upgrade its opening-up structure. · Inclusive development means development is always for the people, of the people and shared by the people. The 13th Five Year Plan and the five development concepts aim to address existing challenges, make up for weak links, empower the engine of growth and consolidate comparative strengths. The ideas and concepts will guide China’s economic development in the next five years and beyond. With the implementation of the Plan and related reform measures, China’s economy will continue to grow with steady progress. · China has the potential and capability to sustain medium-to-high growth in the long run. · The long-term, overall trend is positive. · However, the downward pressure of the global economy, and the economic transition and upgrading inside China, means that China’s growth will not be all plain sailing. · From time to time challenges and difficulties will occur, including stock market fluctuations. · But China will not hide from problems or deny them. · China has the confidence to face up to the challenges and prevail. Let me turn to the second question. Today, China has deeply integrated itself into the world. This means that the Chinese economy is very much part of the global economy. The outcome of this historical change is very positive for all humanity. For Chinese people China’s development has benefitted from such integration. For the world people China’s development is delivering benefits. So my answer to the question is, China’s development means opportunity to the world. It means opportunity to the UK. There are five reasons why I believe so. First, China’s development is a contribution to the common development of the world. After more than 30 years of high-speed growth, China is now widely recognised as a powerhouse of the world economy. In particular, in times of global economic crisis, China has taken decisive actions to power up growth. This has had a major positive impact when the world economy was facing severe challenges. For example, in 2015, China led the major economies and contributed over 25% of global growth. China is now the biggest country of origin in terms of overseas tourism. Last year, Chinese tourists made more than 120 million outbound trips, including 80 million self-arranged trips. This means benefit for many economies as Chinese tourist spending per trip per person was over 1,000 pounds or 11,624 yuan. This trend is especially notable at a time when the global consumption was sluggish. According to VisitBritain, in the first nine months of last year, Chinese tourists made 214,000 trips to the UK. These Chinese visitors spent a total of 435 million pounds. Chinese tourists are no strangers in London, Edinburgh, and of course, here in Bath. China is now the world’s biggest trading nation and second largest investor into nations outside of China. In the next five years, China will import more than 10 trillion US dollars in goods and make over 600 billion US dollars in overseas investment. All these facts demonstrate how China has become a major driving force for global consumption and investment. In addition, this role will remain unchanged in the years to come. Let me put it this way. The development and progress of a country with 1.3 billion people is in itself a huge contribution to the world. It is a major force for good to deliver peaceful and sustainable global growth. This is a mutual benefit for all humanity. Let me now turn to the second benefit. China’s newly introduced opening-up measures will bring new opportunities to the world. This means that China will keep its door open, further liberalise its market and improve rules and institutions. You will recall that the first round of ‘reform and opening up’ started in Shenzen over three decades ago. The eventual impact across China was profound. That saw the industrialisation of China that is unmatched in human history in terms of scale and speed. · And the “power list”. These three lists have greatly promoted trade facilitation. With the financial services sector, China will open up its market and increase access in an orderly fashion. This will facilitate foreign enterprises, institutions and individuals in their businesses and cooperation in China. China has also introduced the ‘Belt and Road’ initiative. This is a vision of an economic belt that extends from the Asia-Pacific region in the east to Europe in the west. Projects are already underway in many countries along this belt. This will create a new growth point for the world economy. China will continue to build an open economy. China is ready to share the opportunities of its development with the world. My third benefit is that China is doing its best to advance international cooperation on development. China is committed to higher-level and deeper South-South cooperation. We have worked to help with the economic growth and life improvement in fellow developing countries through a number of proposals and concrete actions. During the UN meetings for commemorating the 70th anniversary of its founding last year, President Xi Jinping announced China’s decision to establish a fund to support South-South cooperation. The initial pledge of two billion US dollars will be used to support the implementation of the 2030 Agenda for Sustainable Development. In the next decade, China will establish a China-UN peace and development fund with one billion US dollars. China will also join the new UN Peacekeeping Capability Readiness System. Through this China will create peacekeeping forces consisting of a police unit and emergency standby teams. · 100 poverty reduction programs. · 100 agricultural cooperation projects. · 100 trade promotion and aid programs. · 100 environmental protection and climate change programs. · 100 hospitals and clinics. · And 100 schools and vocational training centers. · And help train 500,000 technicians. · Increasing investment in the Least Developed Countries. · Cancelling some of the debt of designated nations. · And setting up an international development knowledge centre. The fourth benefit is that China as a big country is doing its bit and taking up its responsibilities. China is committed to world peace and development. In the face of global challenges, China has been a consistent and responsible player. The Chinese Government has taken concrete steps to tackle the shared world difficulties. One example is the comprehensive, balanced, and ambitious agreement at the Paris Climate Change Conference. China worked very hard with other countries to enable the conclusion of the agreement. China has also actively pushed for reforms of global economic governance. The aim is that the IMF, World Bank and other international economic and financial institutions will truly reflect the changes in the global architecture. Such reforms do not mean to abolish the existing system and ‘reinventing the wheel’. They are meant to improve the management of the global economy through innovative approaches. This year, China will host the G20 Summit in the city of Hangzhou. China hopes to join hands with all other parties to work for better global economic and financial governance at the summit. In this same spirit of mutual co-operation China has made other initiatives. For example, the establishment of the Asian Infrastructure Investment Bank (AIIB) and the New Development Bank with other BRICS nations. The thinking behind these new banks is that they will serve to compliment, rather than replace, the existing global financial system. The recent decision of AIIB to undertake a joint loan with the Asian Development Bank is welcome news. It certainly shows that it is fully possible for the AIIB and other existing multilateral development banks to pool their respective strengthens and engage in win-win cooperation. · To firmly uphold the international order and system underpinned by the purposes and principles of the UN Charter. · To build a new type of international relations featuring win-win cooperation with other countries. · To enrich the idea of community of common future for all mankind. · And to spread the idea of global governance that is widely consulted, jointly built and shared by all. The fifth benefit is that China’s development will bring more opportunities to the UK. · To jointly build the global comprehensive strategic partnership for the 21st century. 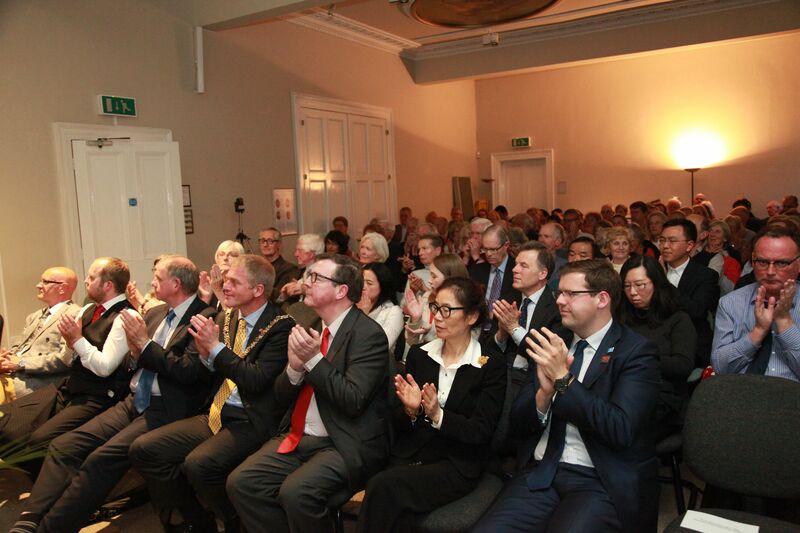 · And open up the “Golden Era” for enduring, open and win-win relationship between China and the UK. This State Visit has charted the course for stronger and result-oriented cooperation between China the UK. At present, Britain is China’s second largest trading partner in the EU while China is Britain’s second largest trading partner outside the EU. Last year our bilateral trade volume was a steady 78.52 billion US dollars. Chinese non-financial, direct investment in the UK totaled 13.2 billion US dollars. This has made the UK the top destination for Chinese investment in Europe. The UK also tops the list in many other areas. It is the largest recipient of Chinese students. Now about 150,000 Chinese students are studying in the Britain. The number of British students in China is about 6000. There are also 55 twin city relationships between our two countries. Opportunities for cooperation exist, not only in bilateral fields, but also in global affairs given the global vision and influence of both countries. 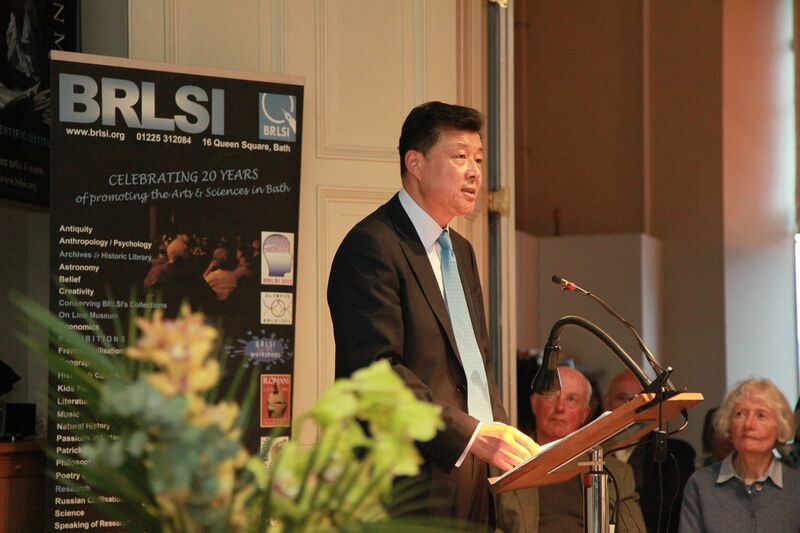 · Both China and the UK are key players and responsible partners in world affairs. · Both are permanent members of the UN Security Council. · Work together on innovation and reforms in order to provide the right leadership to world economic development. · Join hands to deliver progress in international development cooperation. · Pull together on reforms of the global economic governance. · And make concerted efforts to safeguard international and regional peace and stability. Talking about regional peace and stability, there is one issue that caught the world’s attention recently. This is the South China Sea. Not long ago, I wrote articles for the Times and the Financial Times respectively to expound on the Chinese government’s position. I would like to use this opportunity to go a bit deeper into this topic as I believe it must be of interest to many of you here this evening. The South China Sea issue, at its very heart, is about disputes over territorial sovereignty and maritime delimitation. The issues arise from the illegal occupation of part of China’s Nansha Islands. The Philippines, Vietnam and others have since 1970s illegally occupied a total of 42 islands and reefs in Nansha, based on which they made their “maritime claims”. Some of the countries attempt to get away with illegal occupation by referring to Nansha Islands as “Terra Nullius” and claiming “prior possession”. Others try to invoke “geographical proximity” as justification. The Philippines went even further as to initiate a so-called “arbitration”. Let me share with you some historical facts. As early as 200 BC, during the Han Dynasty, the Chinese were the first to discover the islands and reefs in the South China Sea. That was almost 200 years before the city of Bath was built, which was in 43 AD. Back then, Chinese were recorded to have large-scale sea-faring and fishing activities in the South China Sea. Today, Nansha of the South China Sea is called Spratly in the western countries. The reason for the name difference comes from a Richard Spratly a British sea captain. Spratly thought it was he who had “discovered” and “named” the islands in 1843. But actually the Chinese had named the Nansha Islands about 2,000 years before he did. China is also the first to conduct administration in the South China Sea. The Tang Dynasty was established in China between AD 617 and 907 and, ever since then, successive Chinese governments have maintained administration over Nansha and the waters around them. This means that China’s sovereignty claims are built on strong historical and legal evidence, which the international community have long recognised. China is also the first country to develop and live on the islands in the South China Sea. For centuries, the Chinese have been engaged in fishing, planting and other activities on the islands and in the nearby waters. The remains of this continuous habitation can be seen through archaeological evidence. For example, piles of building foundations, wells, temples, tombs, can be seen and found on many of the islands. The world famous Ashmolean Museum in Oxford has a collection of maps of the South China Sea. These clearly testify about these early activities by the Chinese. The fact that only Chinese lived on the Nansha islands is recorded clearly in the book called The China Sea Pilot published by the British Navy in 1868. This extensive historical evidence points to the fact that the islands and reefs in the South China are not “Terra Nullius”. · In 1933, France invaded nine islands in Nansha. · The then Chinese government lodged solemn representations to the French authority and the general public in China denounced the invasion. · During World War II, the islands in the South China Sea were illegally occupied by Japan. · After the war, China restored sovereignty of the Nansha Islands in accordance with the Cairo Declaration and the Potsdam Proclamation. · In 1948, the Chinese government announced the ‘dotted lines’ to reassert China’s sovereignty and related rights and interests in the South China Sea. For decades after World War II the South China Sea has never been an issue. There was no challenge on China’s sovereignty over the Nansha islands and the waters around it by any country around the South China Sea. But, during the 1970s some countries try to lay claim on the natural resources in the South China Sea. It was then that some nations began to occupy illegally some of the islands. · Inform you about the past. · Help you gain an accurate understanding of the situation today. · And, be accurately briefed about the position of the Chinese government. Over the years, China has all along exercised a high-level of self-restraint. China has always stood for solving disputes peacefully through friendly consultations and negotiations between countries in the region. Take the case of relations between China and the Philippines. China and the Philippines have long since reached an agreement on a bilateral approach to the South China Sea disputes. The Declaration on the Conduct of Parties in the South China Sea was signed between China and ASEAN (the Association of South East Asian Nations) where China and the Philippines are both members. In that Declaration on the Conduct of Parties in the South China Sea there is an explicit commitment to friendly consultations and negotiation for a peaceful resolution. At present, China and ASEAN countries are having talks on formulating the “Code of Conduct” in the South China Sea. Such joint efforts between China and ASEAN are paving the way for the appropriate settlement of the issue. However, Philippines decided not to abide by the spirit of the Declaration on the Conduct of Parties in the South China Sea which they signed. Instead the Philippines chose to the route of arbitration unilaterally through the Permanent Court of Arbitration in the Netherlands. This action by the Philippines has seriously damaged and undermined regional peace and stability. China has consistently and repeatedly stated that it rejects and does not accept the arbitration claim by the Philippines. Related to this so-called arbitration are repeated assertions in the foreign media outside China. These claim that China is not obeying the established and agreed maritime laws governing the oceans and seas of the world. Is China violating the international law as some has claimed? Absolutely not and quite the opposite. The so-called arbitration is illegal and invalid from the very beginning because it is in essence about territorial sovereignty and maritime delimitation. The United Nations Convention on the Law of the Sea (UNCLOS) does not have jurisdiction over issues related to sovereignty. As for maritime delimitation, China made a declaration years ago in accordance with the UNCLOS to exclude disputes on maritime delimitation from compulsory arbitration or any third-party mechanism. Over 30 other countries, including the UK, have made similar declarations. That is why the arbitration case brought by the Philippines against China is illegal and invalid. In reaction to that arbitration what China did is simply exercising its legitimate rights empowered by the international law. The behaviour of China, in terms of international law, is beyond reproach. What really does damage to international law is the act of the Philippines in going against its early commitment. This action is undermining the authority and integrity of the UNCLOS. Another frequently asked question is about current activity on islands in the South China Seas that are the sovereign property of China: Will China’s development of, and construction on these islands affect the freedom of navigation in the South China Sea? The answer to this question is very clear: Certainly not. Apart from minimum defence facilities, the construction on China’s own islands are primarily civilian in purpose. They will enable China to better fulfill its international obligations, including maritime search and rescue, disaster relief and prevention, maritime scientific research, meteorological observation, eco-environmental protection, navigation safety, and fishing services. As for the “concerns over freedom of navigation”, this is completely a false argument. Every year more than 100,000 vessels pass through the South China Sea. None of them has been ever run into any problem with freedom of navigation thanks to the joint efforts of China and other countries in this region. In fact, no country cares about freedom of navigation and over-flight in the South China Sea more than China. This is why: China is the biggest littoral state in the South China Sea. Every year 70-80% of China’s trade and energy supply pass through the South China Sea. A large number of Chinese fishermen make a living in the South China Sea. China’s construction in the South China Sea is not just for the development of its own islands. Better infrastructure on these islands also provides public benefits to countries in the region. Instead of affecting the freedom of navigation, these facilities will offer services and protection to ships passing by. According to Reuters interview with some ship owners throughout Asian countries, China’s building efforts in the South China Sea are good for maritime safety and security, as the rescue capability deployed on the islands can provide immediate help and increase chances of survival. Peace and stability is of great importance as well as the freedom of navigation in the South China Sea. To achieve that, all must work together. But if “freedom of navigation” became an excuse to flex military muscles, this poses a serious threat to peace in the region. Actions of certain countries to send military jets and warships on close-in reconnaissance in the nearby waters and air space of China’s islands and reefs is a dangerous provocation to China and its sovereign rights. China cannot be expected to ignore a direct challenge to the sovereignty, security and maritime rights of its own legitimate territory. Such military actions on the pretext of “freedom of navigation” is in reality a license to bully. That would be the biggest threat to the real freedom of navigation and the peace and stability in the South China Sea. It is understandable that some countries outside the region pay close attention to the South China Sea. China positively encourages these countries to speak up and do things that are in favour of peace and stability in the region. What China finds intolerable is actions that sow discord among countries in the region, or actions triggering troubles. China is opposed to any behavior that threatens others and undermines stability. Given all those points, I can assure you that China will continue to work with all parties to safeguard the peace and stability of the South China Sea. China seeks to build it into a sea of peace, a sea of friendship and a sea of cooperation. Today, I have talked about China’s development and what it means to the world. I hope that my speech has offered a fresh perspective in seeing ‘World Affairs through our eyes’. The two giants of human endeavour, Charles Darwin and Xun Zi have told us about one truth – the importance of perseverance. That is crucial factor if any success is to be secured. Perseverance is what we need in strengthening our communication. Perseverance is needed in promoting stronger cooperation, in creating brighter prospects for the “Golden Era” of China-UK relations. And perseverance is essential in making any contribution to world peace, development, and the advancement of human civilization. 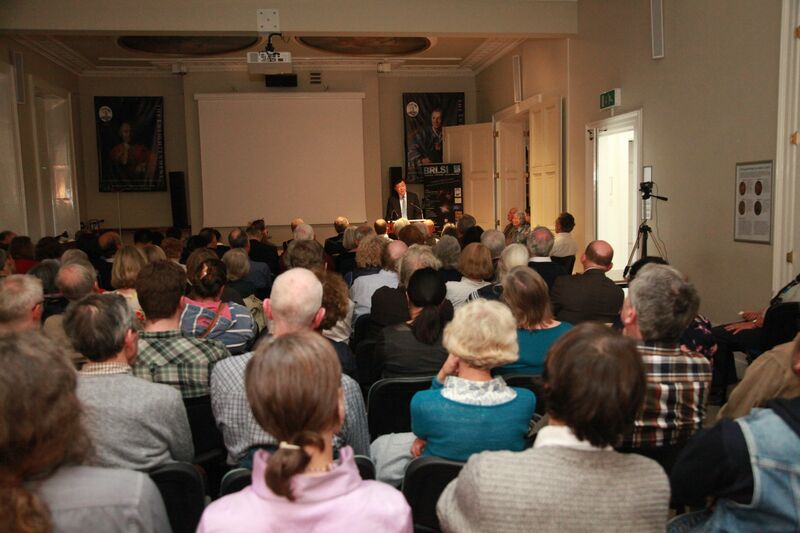 In conclusion, I wish the City of Bath greater success in economic and social development. I look to the continued contribution from Bath to the friendly interaction and win-win cooperation between China and the UK.